related portals: Patents, Railroad engineering and operation. JOHN RUGGLES, OF THOMASTON, MAINE. LOCOMOTIVE STEAM-ENGINE FOR RAIL AND OTHER ROADS. Specification of Letters Patent No. 1, dated July 13, 1836. Be it known that I, John Ruggles, of Thomaston, in the State of Maine, have invented a new and useful improvement or improvements on locomotive-engines used on railroads and common roads by which inclined planes and hills may be ascended and heavy loads drawn up the same with more facility and economy than heretofore, and by which the evil effects of frost, ice, snows, and mud on the rail causing the wheels to slide are obviated. The obstacles met with in ascending inclined planes with locomotives drawing heavy loads after them, are the want of power in the engine, and the deficiency of adhesion to the rails, my improvements are designed to give a multiplied tractive power to the locomotive and to prevent the evil of the sliding of the wheels, and for these improvements I have made application for a patent to be issued according to the provisions of law. The following is a full and exact description of said improvements. To prevent the wheels from sliding on the rails I make use of a check rail, and retreating cogs, the cogs are applied in the following manner, the wheels are made in the common form except that the rim is somewhat wider than the flange to the outside of the tread it should be no wider than the past the rail sufficiently, and its width must be further extended 1¾ inches. This extended part of the rim at the periphery thereof is 1½ inches less in diameter than the bearing periphery. The accompanying drawings are made a part of and are referred to in this description for the better understanding thereof. A transverse section of the rim is seen at a. in Figure 2, and it is more fully shown in Fig. 3. This extended rim is pierced with 24 holes, or square sockets, where the wheel has 12 spokes, for the reception of the retreating cogs, they are 1¼ inches square at equal distances apart, and ¼ inch from the bearing part of the rim, the cogs move freely in the sockets in the direction of the radii they are shown at b, b, b, b, in Fig. 1, they have shoulders on their inner ends to stop their outward motion and a project through the rim ¾ of an inch, leaving their outward ends chamfered, and curved as shown in the drawings, the cogs are kept in their places by spiral springs pressing upon their heads with sufficient force to project them outward easily when pressed up into their sockets, the springs react against the top of a cap, or case made to inclose, and protect them from mud or other impediments to their easy action, the case is in form of the section of a cone, and may be seen at W, W, Fig. 1, it is fitted, and screwed firmly to the rim, the upper and being supported by braces d, d, which are fastened to the spokes, attached to the cogs is a rod about half an inch diameter passing up through the spiral spring and freely through the top of the case, and brace projecting half an inch above. This rod guides the motion of the cogs, the case may be about 2 inches high, and 2 inches broad at its base. The check rail B, is placed on the outside of the bearing rails so far distance that the bearing part of the rim of the wheel cannot reach it when running close to its flange, the teeth are ⅝ of an inch in depth, and such distances apart that the cogs will take against every 3d, 4th, or 5th tooth according as there may be a greater or less distance between the cogs. The check rail is fastened by nails, or otherwise to the sills at such elevations that the bottom of the teeth shall be level with the top of the bearing rail, the back part of the teeth are sloped, and curved, and their front, or flange is made to sloped back about ⅛ of an inch, the rail may be 1½ inches square measuring from the top of the teeth. The periphery of the extended rim should run close to the teeth of the rail, but not so near as to touch them. On the locomotives arriving at the foot of an incline plane where the check rail is laid if the cogs do not happen to come in gear with the teeth of the rail, but touch upon them they readily retreat out of the way as the wheel rolls along offering no material resistance to its motion, while the wheels adhere to the bearing rails the aid of the cogs is not wanted, as soon as the increase of traction occasions them to slide the cogs instantly slipped into gear, and hold the wheel in check, and whenever the wheels get out of gear their own action instantly restores them, the points of the cogs being even with the tread of the wheel descend upon the check rails and a cycloidal arc, and leave it began in the same manner relieved from their pressure against the flank of the teeth as they raise behind the wheel. Their action is attended with very little friction acting only when necessary to supply the deficiency of adhesion and their pressure against the flank of the teeth is only the balance of the leverage which is not sustained by the adhesion at the tread. They are not subject to the evils attending the use of fixed cogs which must almost necessarily be broken in their first contact with a rock laid at the foot, or top of an incline plane if they do not chance to enter into gear, and whose stubbornness subjects them to frequent accidents, an injury, besides the great friction which attends their action under all circumstances. The retreating cogs are endowed with the faculty of getting out of the way when not wanted, and of instantly being in-service without prompting, when they need is necessary. For planes much inclined the distance between the teeth should be such that the cogs shall over lay them about ⅟₁₆ of an inch. The cogs should be applied to each of the working wheels. To enable locomotives to ascend inclined planes with heavy loads it is necessary also to give them an increased tractive power; I effect that object in the following manner, which is described as applicable to geared locomotive engines, but all locomotives may be geared for this purpose. 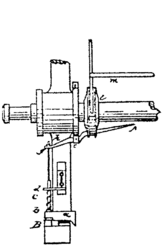 There are the driving shaft taking its motion from the connecting rod and the following shaft communicating the motion to the main working wheels by cranks, and shackle-bars. On the driving shaft are caught wheels A, and C, Fig. 4, fixed to the shaft, on the following shaft are corresponding wheels B, and D, kept constantly in gear with A, and C. B, and D are loose on the shaft, and revolve freely around it except when they are alternately fixed, and held firmly by the spears E and F, on either side of B, and D, are the supports G, and H, fixed to the shaft, they are perforated for the blades of the spears to pass through and enter between the arms of the cog wheels. The gage bar I has two forks whose prongs lie in the grooves around the spears which are moved altogether laterally by means of a lever applied to the gage-bar, conveniently placed under the command of the engineer, the spears have the aid of a feather on the shaft, as well as of the supports G and H. By this means, the wheels B and D are alternately held fast to the shaft as occasion may require, when one is fast, the other revolves freely around the shaft without impediment to the one in service. It is readily perceived that by increasing the diameter of the wheel D, and diminishing C, the tractive power of the engine may be increased four fold if desired in chinaging the running gear as described. A, and B, are the common moving gear combination in due proportion speed, and power for the level, and moderately undulating part of the road. On entering upon the ascent of an incline plane, or hill, as the momentum acquired on the level is spent, and the power of the engine begins to fail, the engineer, cutting off the steam for an instant, removes this spear E, and brings the other into gear by a single motion of the lever, without stopping the progress of locomotive. It is thus an able to move on up the plane with less speed than a level but with the redoubled power. When arrived at the summit the other wheels are brought into action again in like manner, and the locomotive proceeds with its accustomed speed. The tractive power of the engine may be just doubled, trebled, or quadrupled to adapted to the grading of the road on which it is to be used. Another mode of changing the gearing by holding fast the two wheels B, and D, alternately, is by means of levers placed in a groove lengthwise the shaft, one arm of which being raised operates like a feather entering a notch or groove in the bush of the wheel, the arms of the levers are raised, depressed by a slide, and gage bar as shown in Fig. 5. Another mode is by moving the wheels B, and D, into, and out of gear alternately by a lateral motion on the shaft, effected by a gage bar with arms, shown in Fig. 6, as also another mode as at Fig. 7. I have also a method of drawing the retreating cogs within their sockets. But I do not consider this as necessary to their successful application, and use. It is however described here as there may be circumstances under which its adoption may be useful. It is thus: the rod attached to the cog is continued of a diminished size, not exceeding ⅟₁₆ of an inch, to within 1½ inches of the nave where it passes freely through the end of a lever which lifts against a nut on the end of the rod. This lever seen at h, in Figs. 2 and 3, passes in the direction of the axle inward, moves on a pivot in the projecting part of the nave at i, and the other arm inclines toward the axle and shown in Figs. 2 and 3. Encircling the axle at l, is a circular slide through holes in which the arms of the levers pass, and when moved on the axle from the nave it raises the arms of the axle, and thus draws the cogs within their sockets. This slide is moved by the gage bar M, having prong switch rest in the groove around the outer edge of the slide. This like the other gage bars, are moved end-wise in fixtures by means of a lever placed in any convenient manner to be within reach of the engineer. By this means whether the engine be at rest, or in motion, all the cogs are drawn into their sockets at once by a single motion of the engineer. There is one lever between each to spokes, each raising two cogs. The principal advantage of this is the withdrawing the cogs from action in descending a plane, where a check rail is laid when their use is not necessary, and thus avoiding the wear of them. It may be found useful too on curves in an ascending plane to withdraw the cogs of the inside wheels from action, facilitating the adjustment of the wheels to the curved rails. 1. The retreating cogs operated upon by a spring, and the manner by which they are made to operate with trifling friction, and the combination therewith of the machinery by which they are drawn into their sockets, and their application in connection with a check rail to prevent the sliding of the wheels of a locomotive on the rails of a railroad. 2. Also the application to, and combination with the moving gear of locomotive engines, of the additional wheels, and the aforesaid described spears, and supports, and gage bars, so arranged as to produce at pleasure a multiplied tractive power, as well as railroads as on common roads: But I do not claim the said spears, supports, gage bar, and wheels of different diameters by which power, and velocity are increased, and diminished for ordinary mechanical purposes, but their application, and combination only as aforesaid, nor do I claim to be the inventor of the check rail; I contemplate the further application of the principle of this invention by making use of a flat spring instead of a spiral applied either to the head of the cog, or to the top of the rod attached thereto; the spiral spring may also be placed at the nave, and I contemplate the application of the retreating cogs to a single wheel placed in the center between the rails, and also to a rim to be made on the outside of the flange. 3. I also proposed the application of this improvement to all parts of the railroad and seasons, and regions of frosts, ice, and snows, and wherever the inclination is so great as to require the reverse power of the engine to check the dissent, and where the adhesion of the wheel is insufficient for that purpose, the cogs may be so formed as to take against the check rail in descending as well as ascending; another mode of working the levers which raise the cogs is by means of a hollow cone surrounding the axle seen at p, in Fig. 3; as it is moved forward by the gage are the ends of the arms slide up and shallow grooves on its surface. NORRIS PETERS LITHO. WASHINGTON D. C.